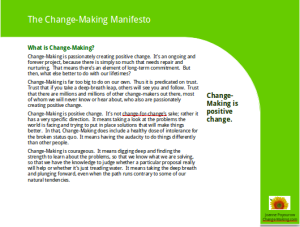 What is Change-Making all about? Change-Making is passionately creating positive change. 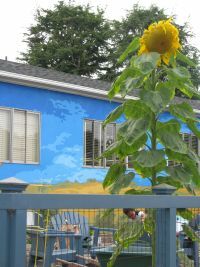 It’s an onging and forever project, because there is simply so much that needs repair and nurturing. That means there’s an element of long-term commitment. But then, what else better to do with our lifetimes? Charles Eisenstein — visionary, philosopher, social critic, and author — is coming to L.A. this month! Eisenstein’s latest book is The More Beautiful World our Hearts Know is Possible. In it he sagely describes the emotional, social, civilization-wide “between” that is transition. It’s the space between the old (worn-out, flawed, unfilfilling and unfulfillable) story, and the new Story of Interconnection. Charles Eisenstein has long been associated with the ideas of the gift economy. You may recognize him from his previous book, Sacred Economics, which was equally ground-breaking in its approach. What happened to the GMO-Free Zone? Not everything we do comes out successful. Sometimes we have some rather spectacular failures. Hopefully, we learn from them, we dust ourselves off, and we continue on. When you’re fighting GMOs, you know that at some point you’ll encounter opposition. It’s inevitable. And for us, the day the Big Guys exercised their significant muscle was December 8, 2014. It felt like running at 60 m.p.h. into a brick wall. Up until that point, our initiative to make L.A. a GMO-Free Zone had pretty much flown through all the channels of government. Sure, it was hard work, but it was highly successful work. We had TONS of local people on our side: over 5,000 signatures from the general public, 5 endorsements from Neighborhood Councils, and over 100 endorsement letters on file — from a very diverse set of organizations including small business, urban agriculture, seed companies, Latino organizations, environmental organizations, and faith communities. Our mixed coalition included GMO-labeling activists, ECM people, Seed Library of Los Angeles people, and oh so many more. Councilman Paul Koretz remarked that he had not seen an L.A. initiative with that level of public support for a very long time.